This page, at least for the time being will serve as a contact point, and a light news space outlining some of the things we're up to around here. I hope to update a lot of stuff, and give more detail about the amazing artists I've been working with... If you do want to contact us, the phone number is up there at the top right, but I promise that emailing will get you a far better result. Please check out an exciting non-profit I'm helping that's aimed at ending extreme world poverty. It's a big and infinitely gratifying reason that updates to this space will be slow to arrive. You can visit the site and find out how to become involved at Rising International. I may include news about Rising here from time to time, but the best way to find out about it is to just head on over there. By the way, Rough Giraffe is a privately owned, privately operated production and IT services entity. We work solely on projects that inspire us. Our hope is that they will inspire you, as well. CD released! 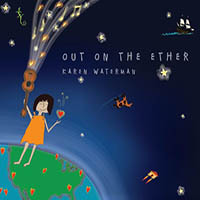 Karen Waterman's "Out On The Ether" is now available at her website (Link at right>) and at most of the big music sellers' sites. A different approch for us. Very fun! Congratulations Karen.. Our journey continues! Just finished a nice demo for Mark Creech here in Santa Cruz! Mark will be appearing more and more around the area with various bands and ensembles. CD released! 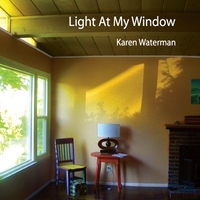 Karen Waterman's "Light At My Window" is now available at her website (Link at right>) and at most of the big music sellers' sites. Great to have this music out there! Congratulations Karen.. a privilege to share this journey with you! Not that we haven't been busy over here. Spending lots of time supporting Rising International. Please check it out if you haven't already. On the production front, we're just wrapping up Karen Waterman's CD Project. It's been an honor and a blast to work with such a talent and a heart. Even got to play a bit myself on this one. CD to be released shortly! Will post links when available. We've just finished production on The Duo CD "Translucent" by GRAMMY® nominated artists Gentle Thunder & Will Clipman, available as a Limited Edition!. Only 200 copies printed! More here! Mixed and mastered here at RGP... a great pleasure to share in the creation of this work! Heartfelt thanksgo out to GT and Will! Wow, folks! Just got the word that Will Clipman has made it into the 51st GRAMMY® Nominations "Best New Age Album" for "Pathfinder", his brilliant solo CD! Congratulations Will! This is such a fine record! It's official! The next offering from Gentle Thunder & Will Clipman (as a duo) is now in hand and ready for mixing and mastering. Release slated for early 2009! 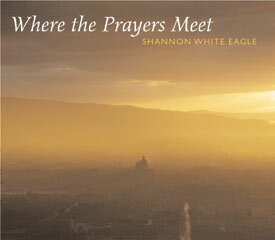 Stay tuned for updates about this upcoming CD by two extraordinary GRAMMY® nominated artists! More about Will Clipman. Welcome to RGP, Will! We're honored to be working with you! "Openig the Gate" AND "Following the Call" just got nominated for "Best Native American Album" in the 2007 NAR Lifestyle Music Awards! Good work and congratulations! Have nearly finished production on Gentle Thunder's new Promo DVD. Due to be completed by year's end. 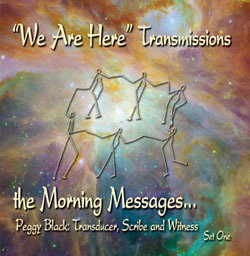 We've just finished production on Peggy Black's Morning Messages 2-CD set entitled "We Are Here". 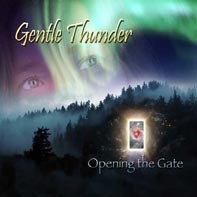 We've just finished production on GRAMMY® nominated Gentle Thunder's Solo CD entitled "Opening the Gate". Soon to be available everywhere. It was recorded, mixed and mastered at Rough Giraffe. Also produced by Gentle Thunder, and Brian Todd. Details and purchase info are currently available on GT's site. GentleThunder.com ... It was an incredible experience to work with you GT! Ann's CD release performance at East West in Mountain View, California was a big success! 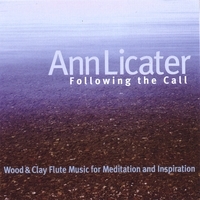 We've just finished production on Ann Licater's Native American Flute CD entitled "Following the Call". It was recorded, mixed and mastered at Rough Giraffe. 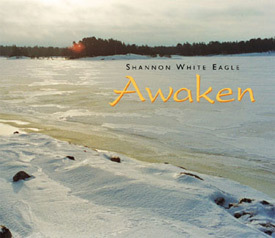 Also produced by Ann Licater, as well as GRAMMY® nominated Gentle Thunder, and Brian Todd.